This Civic Spotlight was submitted by Sunshine. Do you have a story to share? Head over to the submission guidelines page and let me know. I want to put the spotlight on you! If there’s one thing we learn pretty quickly as educators, it’s that there is never enough time. The bell rings while we’re still debating the speech value of a Bong Hits 4 Jesus banner or before we’ve been able to answer the last student question about a Fourth Amendment hypothetical that begins with “So if there’s a party and the cops show up…” We get great ideas and resources at a conference but run out of minutes to turn them into the lessons we want. We have letters of recommendation to write, phone calls home to make, free response questions to grade, websites to update, founding documents to Xerox, hyperlinks to embed, video clips to preload (so we can get through the inevitable erectile dysfunction commercial before our students arrive), and bladders to vacate, all in 55-minute conference periods. We’re pretty good at squeezing every bit of value out of every minute we have, but still find ourselves super jealous of Hermione Granger having that Time-Turner and Adam Sandler’s Click remote. Given that rampant scarcity of available minutes, the fact that the C-SPAN Teacher Fellowship provides the opportunity to, for an entire month, spend your workday creating content that you can actually use in your actual classroom – and get paid to do so! – would make it a worthwhile undertaking if that was the only benefit it offered. But the experience was that and so, so much more. The opportunity to sit, uninterrupted, at length and just immerse yourself in your curriculum and content creation, is priceless not just for the work product it generates, for you and for the colleagues across the nation to whom it’s made available on C-SPAN Classroom, but because it’s a reminder of everything you love about your job and your content, a chance and a challenge to tap into your creative energy and dive miles deeper into topics of interest than your typical available time ever allows. The culture is caring, welcoming, inclusive, supportive, spirited, and dedicated. 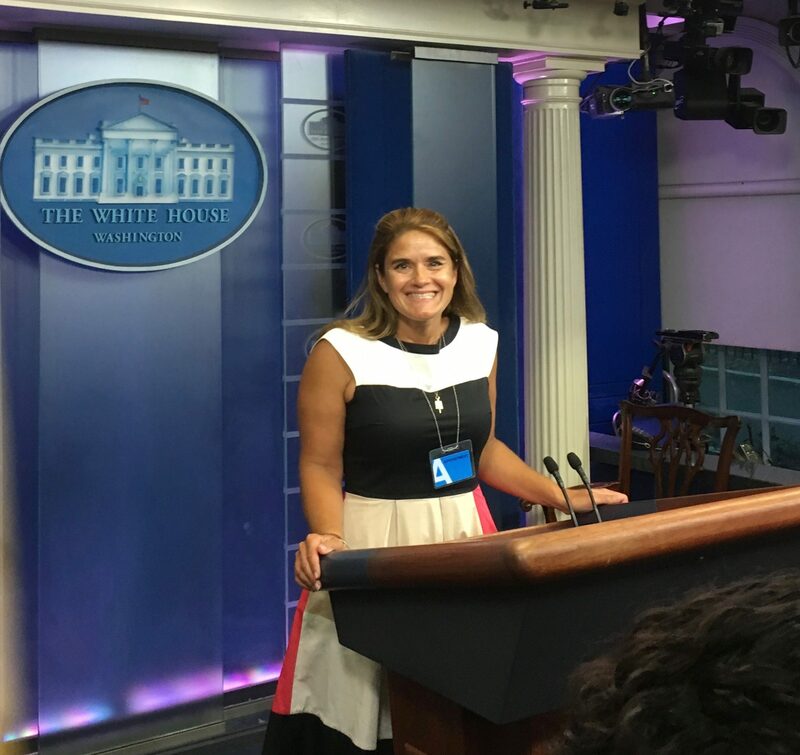 As a C-SPAN Teacher Fellow, Sunshine got a tour of the White House briefing room. C-SPAN is, as well, an amazing place to spend the day. The culture is caring, welcoming, inclusive, supportive, spirited, and dedicated. News is breaking and newsmakers are reacting to it all around your workspace, and everyone is as interested in it as you are. The way they practice is the way we teach – team-oriented and committed to long-form exploration, nonpartisan delivery, intellectualism, growth through learning, and excellence. The C-SPAN team really, really values your perspective and your expertise. In an age where it’s pretty easy to turn on your television or open a social media app and find people criticizing the work teachers do, it’s extra lovely to be treated as a respected professional and have people make an effort to make your already-fabulous experience even better. In addition to having the chance to create content and present at the teachers’ conferences, you can find yourself invited to join a tour of the Capitol led by a C-SPAN producer who worked on a specialty series about its history, attend a session in the White House briefing room, sit in on a radio broadcast, and give input and feedback to ongoing projects. C-SPAN Teacher Fellows Get to Live in and Explore Washington, D.C.
Scooters are a great way to get around and explore Washington. Again, that would all be worthwhile even if you were doing the work in a nondescript warehouse in the middle of a barren plain. But instead, you can grab a Capitol Bikeshare and get to the Lincoln Memorial after work in a matter of minutes. You’re in the heart of D.C.! For a month! Which is not only a dream offering for anyone who loves America as much as you probably do if you’re reading a blog post from a government teacher on a site for civic educators, but as a mama from very suburban Southern California, it was especially amazing to be able to give my kids the gift of not only experiencing city living, but really being able to immerse themselves into all that our amazing nation’s fabulous capital has to offer. 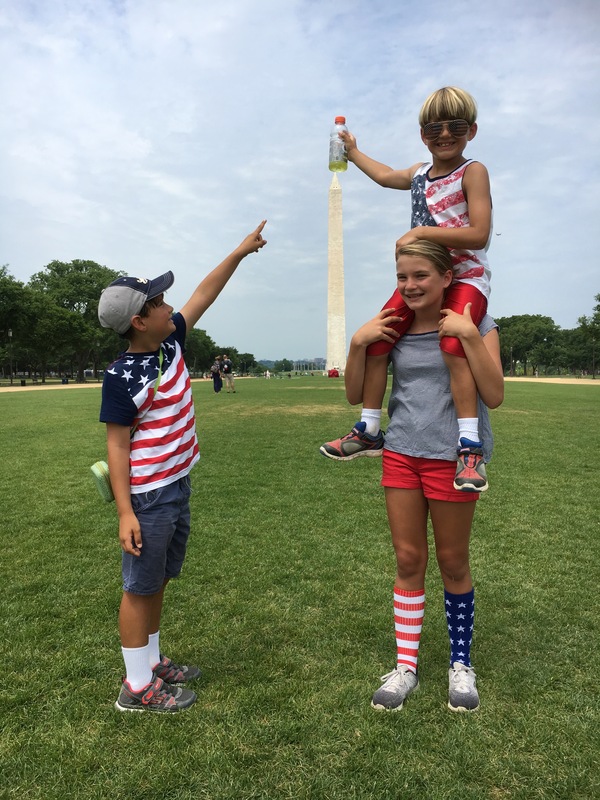 They visited the original Star-Spangled Banner on the Fourth of July. They went to day camps at the National Archives and the Smithsonian. They toured Ford’s Theatre and played soccer on the Mall and ranked the Smithsonian museums both by quality of exhibits and quality of food. 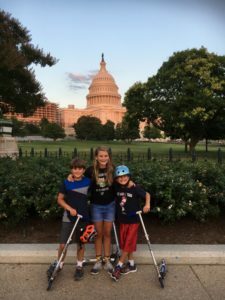 Seeing their perspectives so enhanced and their love for social science so deepened by our month in D.C. was as fabulous as the living-in-a-West-Wing-episode feeling of walking to work with the Capitol as the backdrop. These kids are having a great time exploring Washington, D.C.
You know how you feel when you come back from the summer for preservice full of “It’s always sad to see summer end, but yay! New students! New Sharpies (that, obviously, I bought with my own money)! Exploring content I love with the minds of the future of our world all over again!” energy and then you have to sit in a PD session while someone reads you a text-heavy Power Point slide? The C-SPAN fellowship is exactly the opposite of that. It feeds your back-to-school energy – you can’t wait to share your new lessons with your students! Remind your colleagues that C-SPAN offers premade resources AND 250,000 hours of content, most of which is primary-source material, easily clippable and free! Add a selfie you took at the Washington Journal desk after hours to a bulletin board and wait to see if anyone notices! Find a chance to casually mention how you saw Andrea Mitchell in the lobby and she said your kids were cute! Connect and share ideas on social media with the educators you met at the teacher conferences and the fellows from previous summers! It’s – obviously some of the highest praise a teacher could confer – absolutely worth the time. Bottom line, because you probably already used more minutes than you had to spare reading this: the C-SPAN Teacher Fellowship is both a magnificent opportunity and a tremendous gift. You should apply. It’s as awesometastic, inspiring, enriching, invigorating, and fulfilling as the best day in your classroom. It leaves you falling in love with our country and our content all over again. It’s – obviously some of the highest praise a teacher could confer – absolutely worth the time. You can read more about the C-SPAN Teacher Fellowship and the application process here. Sunshine Cavalluzzi is a social science teacher, Mock Trial coach, and Law Academy coordinator at El Dorado High School (her alma mater!) in Placentia, CA and a 2017 C-SPAN Teacher Fellow. She typically teaches AP Gov, gov, econ, and an elective or two. She should probably rethink her ratios of veggies to Diet Coke and political comedy shows to earlier bedtimes; outside of the classroom, she and her husband can usually be found cheering on their three kids in a sport or show. You can find Sunshine – and plentiful news about EDHS achievemens – on Twitter at @GoldenHawkCav.